The Hampton Roads region in eastern Virginia, United States, faces challenging issues with water quality and land subsidence, but a new project is helping to provide a sustainable source of groundwater.A central part of the system is specialty access doors manufactured by the BILCO Company of Connecticut. The doors protect pumps and vaults in the complex system, and play a vital role in protecting water and other matter from infiltrating the system. Get the latest information from the AEC community via e-mail! Read the latest issue online now. 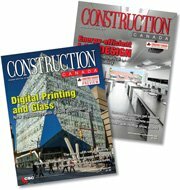 Subscribe to Construction Canada for FREE.